Spirituality can be one of the defining characteristics of ones life. It is the steady soundtrack in the background off our lives, its presence never too far from our thoughts. It is a combination of freedom and awe in the presence of the Creator. Sri Jagdamba Pearls’ Moksh collection of Temple Jewellery aims to celebrate this feeling. Since 1924, we have worked with customers and artisans with varying tastes to bring forth the kind of jewellery that will be passed down through the generations. 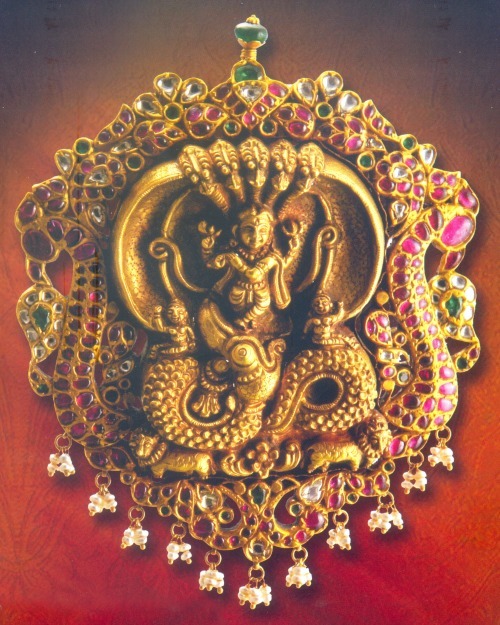 With Moksh, we bring you Hallmarked Temple Jewellery unlike any other. This Temple Jewellery will be exhibited at our stores in MG Road and Hi Tech City till the 18th of August and we welcome one and all to visit us and see the work of our master craftsmen! Our temple jewellery depicts Gods and Goddesses such as Lord Krishna seated on his cow, Natraj in a dance pose, nine avatars of Lord Vishnu with Goddess Lakshmi in the middle are some of the creations we have available on display and for purchase. Called Nakshi jewellery in local parlance, each of these show pieces takes approximately a month to complete, time consuming in the process but a sight to behold when finally done. Necklaces, Kundans and Chokers embellished in diamonds and other precious stones, made in exquisite 100% pure Gold, go well with the waist belts, Jada Alamkarams, Kadas, bracelets, amulets, earrings and pendants fit for maharanis of all ages can be found there. We are exhibiting these unique creations at our stores in Hyderabad and Secunderabad till the 18th of August. You can view all the images in our gallery here. If you would like to order this, please message or call us on +91 720 720 0042. Wear your birthstone with gold chains!